Writing In The Crosshairs: TRUE BLOOD meets THE ARTFUL DODGER_THE LEGEND OF VICTOR STANDISH! TRUE BLOOD meets THE ARTFUL DODGER_THE LEGEND OF VICTOR STANDISH! THE LEGEND OF VICTOR STANDISH! Think TRUE BLOOD meeets THE DRESDEN FILES meets THE ARTFUL DODGER. Beware French Quarter nights. The shadows are hungry. You see, voodoo never died. Here they do not always stay dead. They get hungry. And lonely. Every city has its secrets. New Orleans more than most. To walk its streets is to move through history : Lasalle. Orleans. Galvez. Lafitte. A street map is part time capsule, part history lesson. And all Death. She is waiting in every shadow. New Orleans is the most haunted city in America where Voodoo was big business, slavery even more so, and no government official or newspaper dares to tell the truth. No one talks openly of the misty figures seen walking along iron-laced terraces, casting no shadow. Of the shapes seen rising from sewer grates. And no one willingly visits the crypt of Marie Laveau at midnight. the deadly love of the Victorian ghoul, Alice Wentworth. Roland Yeomans, writes scenes that appeal to all the senses. Memorable characters. Rich dialogue. Looking forward to reading more from this author. I highly recommend this book! The Legend of Victor Standish.....Outstanding! It is the second book I read from this author, Roland Yeomans. It did not dissapoint me once again! Roland's writing is rich and haunting. You will be drawn instantly into a world that is tangible to all the senses and introduced to characters who come alive. I loved this and would highly recommend it to any paranormal fan! Brilliant idea, this, ain't it. Good turn-out, too! Where's the coffee corner? I'm off to your blog right now, then off to work! This sounds like a really good read. Adding it to my TBR pile. Your book sounds really interesting-all the best with the book fair! 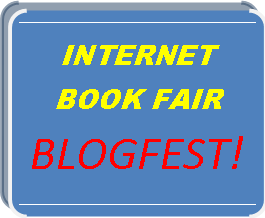 I LOVE this internet book fair idea! And I'm so glad to see Victor is a part of it. I spy my review down there too! :) I can't recommend this book enough peeps, it's excellent. Good stuff, Roland. Keep on keeping on! Ghoulish stuff, Roland. This blogfest is just in time for the season. These are sure some tasty treats for my favorite time of year and i know I'll be picking these up ASAP. Your books look fabulous. Thanks for dropping by my blog today and I'm so glad I've visited yours now! And the best to you at the Book Fair as well! Yes, there your review is. Victor winks his thanks to you. And each review enters the reviewer for a chance for an avalanche of prizes, too. Cross your fingers for me. Didn't Leonora Roy do a great job on my cover? Thanks for going to Amazon for a look-see Victor is crossing his fingers that you'll take a chance on him. LOL. You made my evening and Alice's too. And it is always nice to keep a ghoul happy! LOL.